Important: Please note that the following service will no longer be available from 13 April 2015. Please note that the Market Squawk analysis is provided by a third party which is completely independent from Financial Spreads and should not be taken as investment advice. 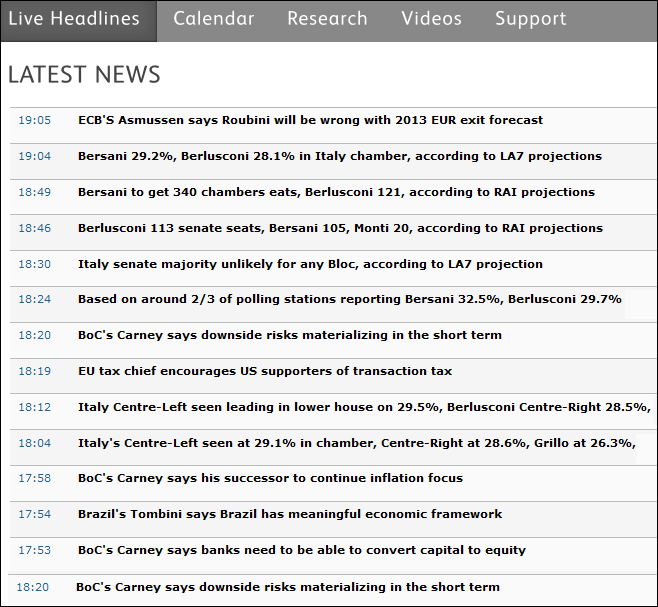 The live audio and text headlines concentrate on the forex markets and their primary influences e.g. giving the salient points of a bond auction or the key points from a Central Bank press conference. 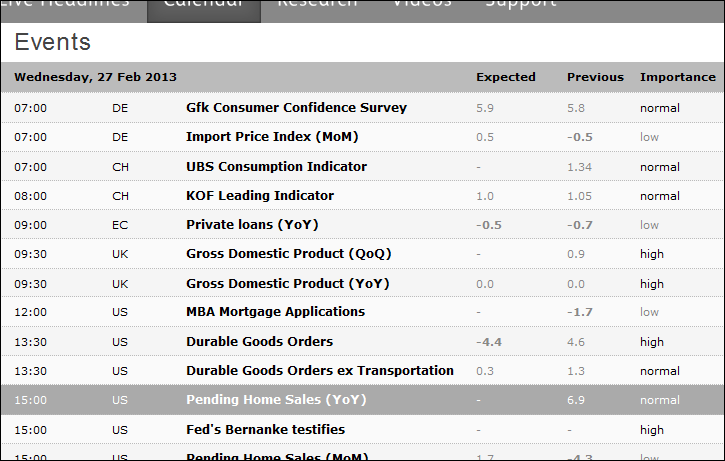 As you might expect, the Economic Calendar lists the key eco-stats of the day along with the perceived expectation and previous result/number. 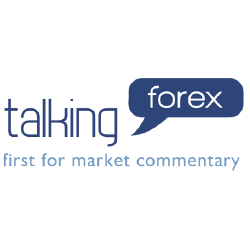 The daily FX wrap talks through popular forex markets such as EUR/USD, GBP/USD and USD/JPY. The analysis looks at the reasons behind both historic and potential price movements. The FX wrap also gives a quick technical analysis update which covers elements like support and resistance levels, moving averages and retracement levels. 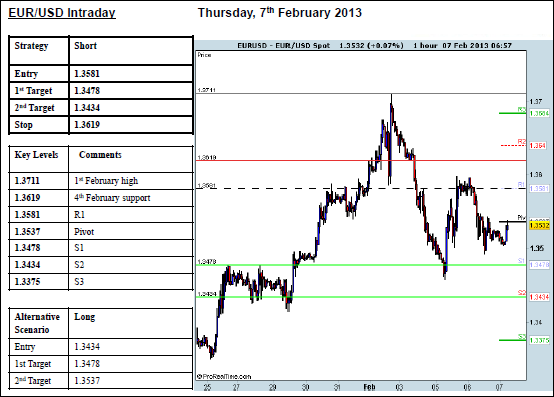 The daily pivot sheet looks at the technical levels of the most popular forex markets. 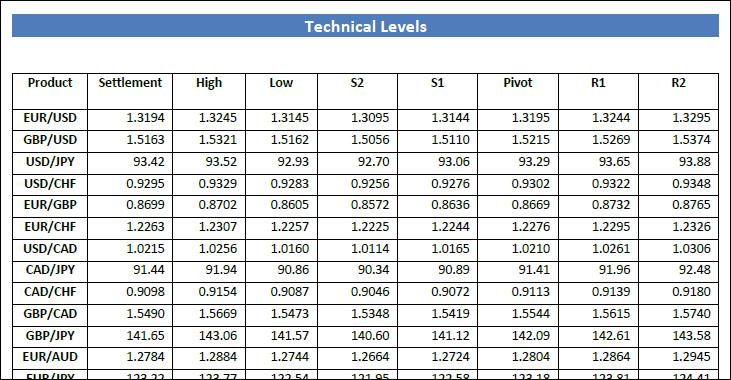 As well as giving the last settlement price and the interday high and low, the pivot sheet also gives two possible support levels, two possible resistance levels and a potential pivot point for each forex market. 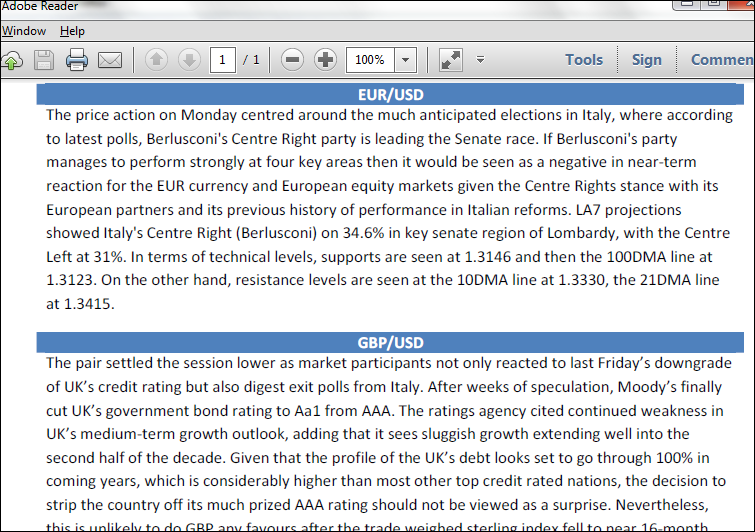 There's also an interday FX strategy report, which normally takes a look at the EUR/USD, GBP/USD, USD/JPY and USD/CHF. As you can see from the following screenshot, the strategy report gives two different strategy options, along with entry levels, potential exit levels, stop loss levels, pivot points etc. UK/EU Data Preview: the key risk events during the UK/European trading day. This video is posted shortly after the European opening bell. European Market Re-Cap: a concise market review of the latest European news as US traders come into the market place. US Data or Major Event Preview: this video is either a run-down of the major US figures of the day or a review of the major macro event taking place during the US trading session. US Market Wrap: a review that comes out after the US cash equity markets close. The video covers the key market moving events of the day and looks ahead to the next trading day. There is a further weekly summary video which looks at the primary trading themes as well as the key topics for the week ahead. 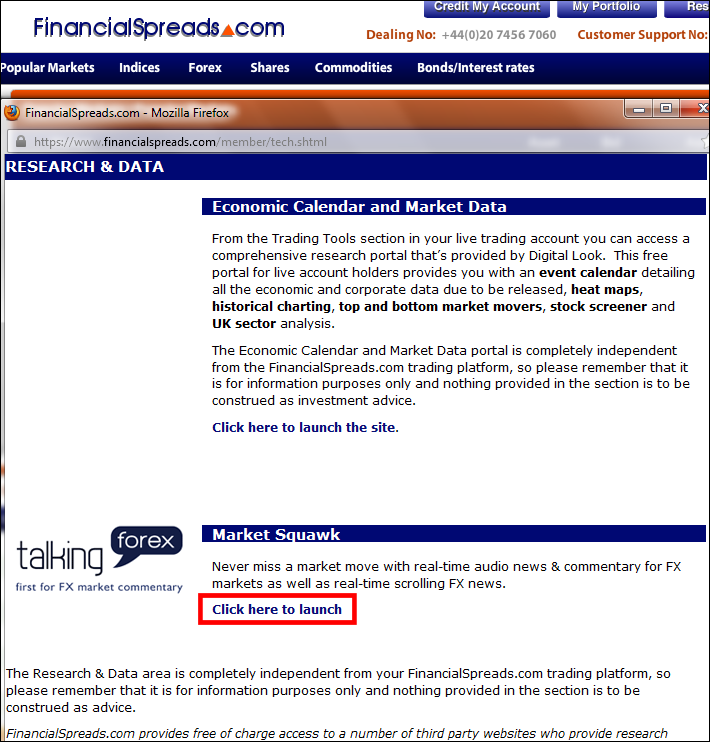 3) Under 'Market Squawk' click 'Click here to launch' e.g. Investors should note that the Research and Data section is completely independent from Financial Spreads. Financial Spreads provides free of charge access to a number of third party websites who provide research analysis. Financial Spreads accepts no responsibility for and has no control over the content (including legality, suitability, accuracy, timelines, reliability or availability) of any linked websites. The provision of third party content is for general information purposes only and nothing in this section should be construed as providing investment advice or a solicitation to purchase or sell any investment. A daily look at the financial markets covering the stock markets as well as the forex and commodities markets. The daily review looks at market support and resistance levels, potential positives, the possible pitfalls and ...» read more. Financial Spreads clients can access buy/hold/sell broker recommendations along with target prices. Review historical and aggregate recommendations. Broker opinions can be viewed as a heat map and...» read more. The Director Deals shows which UK companies are being bought/sold the most by their directors. View the reports as a heat map, see historical deals, review how many shares are being traded and...» read more. Financial Spreads clients can get live Market Squawk audio news and commentary on the forex markets. Plus daily videos, strategies and an economic calendar as well as...» read more. Financial Spreads clients get free access to stock market heat maps. There are also Broker Recommendations and Director Deals heat maps, plus share performance ratios and...» read more. When you log on to your Financial Spreads account, there is a simple and free news feed which you can customise. You can currently subscribe to the Financial Times rss feed for free. However...» read more. FinancialSpreads.com offers free access to a range of analysis, market data, research and news e.g. live Market Squawk, Broker Opinions, Director Deals, heat maps, live charts, a stock screener and...» read more.